No one will have an easier time joining the Bennett-to-the-Bering group than Canadian Susan Walton. While some members of the team are flying or driving thousands of miles to start the paddle, Susan can simply walk out her back door and hop in her kayak. 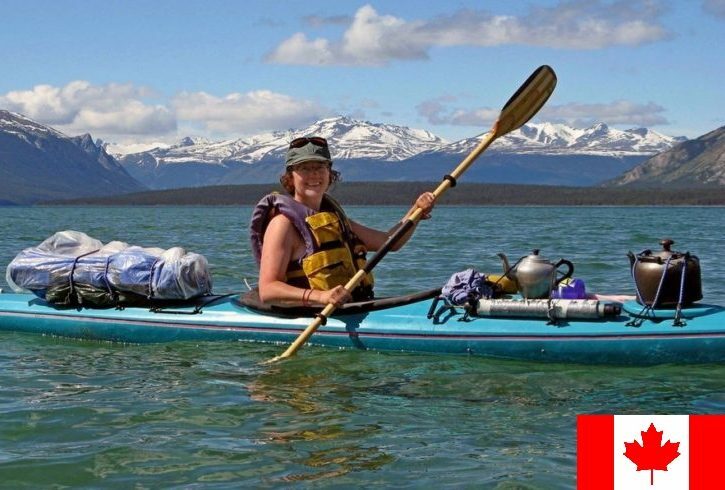 Susan has the great fortune to live in the Yukon Territory on Marsh Lake, one of the beautiful southern lakes that forms part of the Yukon River system. (The lake was also a part of the historic Yukon Gold Rush water route.) Even after living there for over 30 years, the Guelph, Ontario, native hasn’t grown jaded to the area’s natural beauty. Susan, a registered nurse who works at nearby Whitehorse General Hospital, is married to John Streicker, an engineer and elected representative in the Yukon Legislative Assembly. The couple enjoys sharing the best of the Yukon with travelers, and it was their kindness that allowed Bennett to the Bering Producer John Van Barriger to base his first two Teslin & Yukon River trips from their home. “Susan and John are two of nicest people I’ve ever met,” said Van Barriger, “so their aid and involvement with this trip is a real blessing. “Plus, having Susan along in the Yukon Territory gives us local knowledge and a personal connection to the area that we can’t get any other way. More importantly, she’s brilliant, creative, and great fun! She’ll add immeasurably to the group,” he concluded. Editor’s Note: Susan is one of six team members that will take part in the expedition, and the only Canadian participating in the river trip. Read the other team members’ bios to learn more about this unique group.